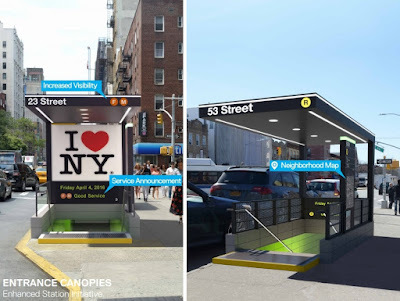 The 31 subway station transformations are going to be “design-build” projects, Cuomo said, which means they will be contracted to a private developer which will be responsible for the design and construction of an entire project. Cuomo said that developers will receive incentives to complete the job quickly, and penalties if the job is late. Car upgrades are to include features such as wider doors, WiFi, USB ports, digital displays & enhanced security. 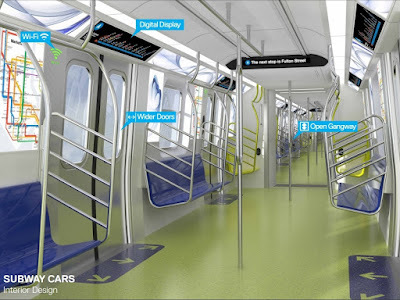 750 new cars will feature an "open car" design, with "accordion" connector passageways -already in use in other major cities - allowing increased capacity & access between cars. Station renovations will include the redesign of street-level entrances, interior lighting & signage upgrades, WiFi & cellphone connectivity, artwork, and in some cases, glass barrierss replacing iron railings. According to yesterday's announcement, historical features at at least some stations will be preserved. According to information released online, the MTA will be issuing RFPs for both projects later this week. As regards the station renovations, the first contract is expected to be awarded in the fall, with closures (rather optimistically) "limited to a six month period." Announced while Bill out of town! 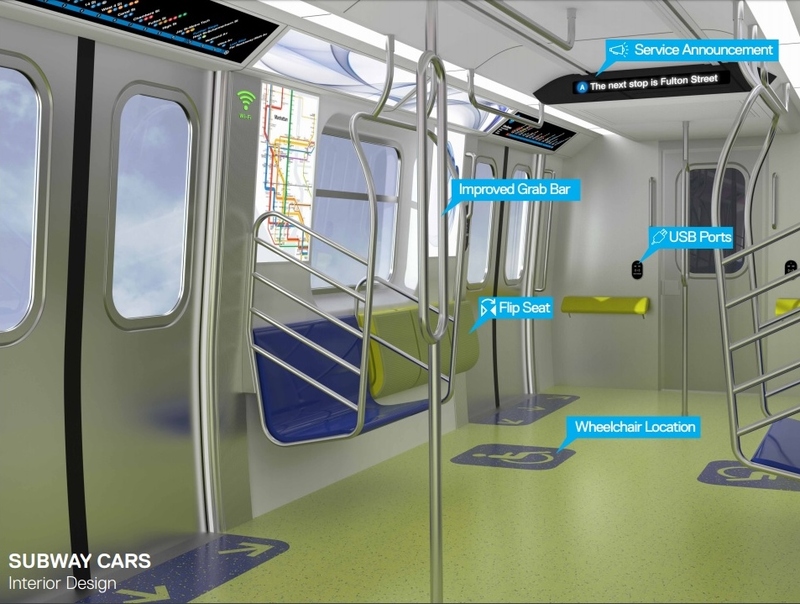 Sleek design, improved route signs, wider doors make sense, but there will be less seats. Cars will hold more passengers, but more of them will be standing. Station street "canopies" look like chain-store entrances. Trad. entrances are iconic features of city streetscape. Redo the ugly design/preserve original features. Accordion design will make life much easier for subway performers/panhandlers!!! 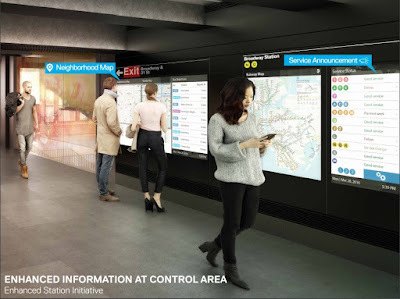 Will this mean the end of R train conductor announcements? Lovely lilting Caribbean accent of female conductor on R today. Music! USB ports will break/achieve obsolescence quickly. Tech. 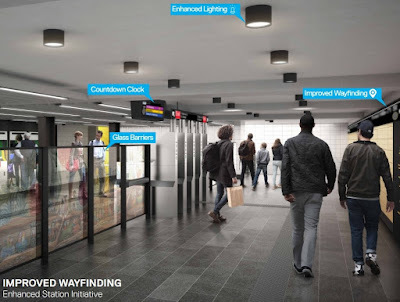 upgrades will ensure more drone activity ..
As said before, that Wayfinding term is silly. How about Directions? Naive question. A car is not a train, right (or wrong)? 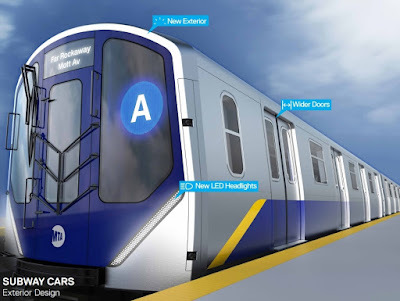 How many new trains will there be? A certain personal conflict between 21st-century reality & city romance??? The subway will do that for you. 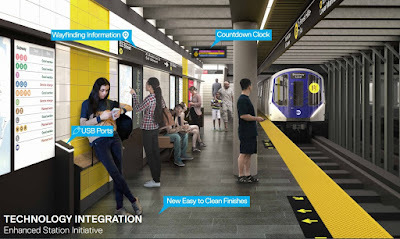 Modernization needed, & new replacements for aging stock important, but .... still fondness for that old subway aura. Read Elizabeth Bishop's ManMoth, & dream.